Since 2007 I have been attending the Harmonica Masters Workshops in Trossingen. I did miss 2008 but after that I have been a regular (every 4th year is skipped dut to the World Harmonica Festival). This was the 12th edition of the event and it was bigger than ever. 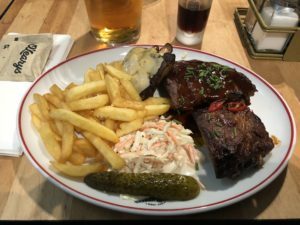 I am recently back from Harmonica Masters Workshops 2018 and this is my trip report. Planning for this trip actually started in November 2016, since there was no event in 2017 it was a long wait but the calender was marked already back then. In December of 2017 I made my booking to Hotel Bären which is my ususal spot when I go. In may the flight was booked during October the final travel arrangements were made. Getting from Stuttgart Airport to Trossingen takes some planning, either by train/bus (4-5 changes), or by taxi (a bit pricey). This year we were lucky that our friend Thomas from Denmark was already in Germany and had a rental car. 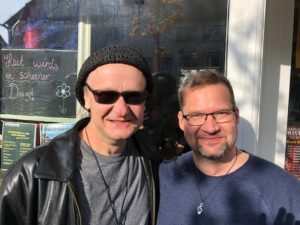 On Tuesday October 30th my trip to Harmonica Masters workshops 2018 started for real. I took the train from Landskrona around lunch my friend Mattias joined me on the crowded train. We got to Kastrup Airport in good time to get through security where our harmonica cases are always taken aside as they look ver strange in the x-ray machine. It has been a tradition to start with a burger (or ribs) and a beer (or two) while waitning for boarding. During this time we were joined by our friend Jolo who took a later train. We had a great time as always waiting for boarding, although airport prices are HIGH!!!! Our plane trip to Trossingen was quite OK, had a few laughs and Jolo’s guitar actually got to ride in “business class” in front of us. We landed on schedule and our friend Thomas picked us up and we headed for Trossingen. Now Harmonica Masters Workshops 2018 was close! 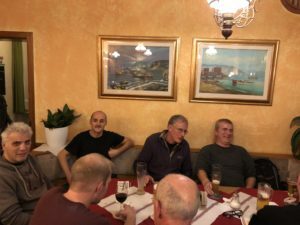 When we arrived in Trossingen we immediately checked in at Hotel Bären and then went to Hotel Traube close by, where most HMW veterans gather on the night before the event. This time is a time of great joy when you meet all your friends from previous years and also make some new friends. These nights never end early. Some of the ususal suspects. The event itself started on Wednesday afternoon with registration at the Music Conservatory. We were all greeted by the mastermind of the event Steve Baker who also presented all the teachers. This year there were 148 students and workshops by Joe Filisko, Eric Noden (guitar), Greg Zlap, Marko Jovanovic, David Barrett, Mitch Kashmar and Riedel Diegel. There is basically something for everyone. Steve Baker himself taught private lessons to a few students. After the introductions we all went to our respective class rooms for our first workshops. I attended Joe Filisko‘s class, he is a great teacher and has a lot of focus on getting great big harmonica sound. In his teaching method he uses original study songs that allow the students to dig deep on the different topics. On Wednesday we had two workshop sessions. Joe started with explaining the key elements to develop to get a good sound and how to effectively use what you know. We also started working on the first study song. The first task was to work on a short riff with basically no technique at all, then we built it out with more and more complex tqchniques added. It really kept us working. Something seemingly simple can in fact be really complex and to execute it well you need everything in order. The evening in Kesselhouse started with a meet and greet hosted by Hohner. They treated us to pizza, beer, wine, t-shirts and competitions (everybody won!). It was a very nice event. Hohner is really supportive of the harmonica community and a great sponsor of Harmonica Masters Workshops 2018. The first musical event of the evening was Joe Filisko’s informal acoustic jam. I participated on a few songs and Joe asked if I would sing as well. I sang “How many more years” which I have done on stage 2016. It was all great fun. After the jam we had an opportunity to go onstage and perform with the help of Christian Rannenberg and Eric Noden. I wanted to try a new song I had been working on so I got up, see it below. The song is in Dm and I played third position on the harmonica. There were lots of great performances in the sessions as always. One of them was Rohan Singhal who turned 13 that night. Very inspiring to see. It had been a long day so after the last session performance was over I went back to my hotel to get some sleep. 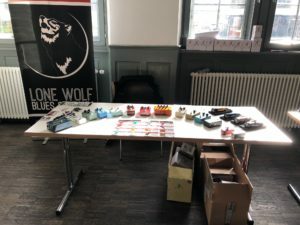 Before the classes started I got a chance to look at the products from Lone Wolf Blues Company who had a stand with their equipment on display. I am not a big advocate of pedals or buying new equipment but they have some interesting stuff. Heinz Jörres was also there with pictures from previous years. I was very happy to find one of me that I could buy. The Lone Wolf Blues Company display. The workshops contunied with the material from Wednesday and we worked hard on the box shuffle song before the lunch break. In the afternoon there was an opening of an exbition of blues pictures by Heinz at the Harmonica Museum. Joe, Eric and Steve performed a few songs as well. In the last workshop of the day Joe opened the floor for people to perform and get feedback. There were some amazing performances during that hour and a half. Joe creates a safe place and people get a lot out of the feedback. I have played in class 2016, 2015, 2014 (Born Blind and Train Imitation), 2011 and 2010 but hadn’t prepared anything for this year. Thursday night followed the same patterna as Wednesday night with acoustic jam followed by an on stage session. As on Wednesday we got to see some amazing performances. I performed again on stage but was not very happy with my performance. It is a very safe environment though, so I didn’t feel too bad. I decided to be smart and go to bad reasonably early this night as well. Friday morning I left a little earlier to go and see the demo room for Marble amps. They had a small room where players could test their equipment. Great sound in that room! There were so many people there that I didn’t get to play but it was fun to listen to. 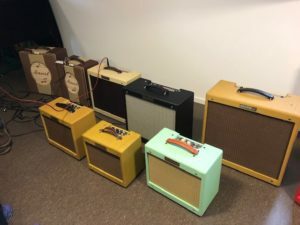 In the workshops we continued working on the material from before and Joe introduced the “Inhale Only Blues” that really challenged us to step us our breathing and get as much blues tone out as possible. The great thing about this is that it is easy to pinpoint what you need to work on yourself depending on what your goal is. Harmonica Masters Workshops 2018 had less extra curicular activities due to the holidays but one thing that was very interesting was the exihbiyion in the harmonica museum. 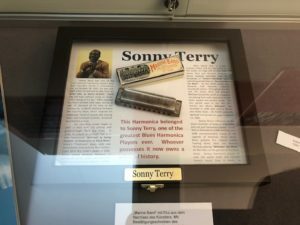 There was a special exhibition about sonny Terry with lots of cool things from his estate. His glasses, a shirt, a harmonica and many pictures and stories. It was my first time in the museum and I am happy I got to see that. One of Sonny Terry’s harmonicas. After the tour I decided to get some extra rest before the evening and skipped the last workshop of the day. I heard there were some great performances there. 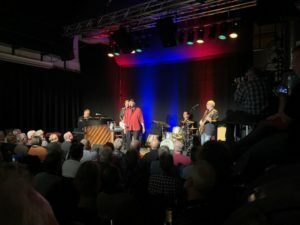 After a nice supper at Hotel Traube I went to Kesselhaus for the Harmonica Masters Workshops 2018 Friday teacher concerts. Kesselhouse was already full when I got there, it was impossible to get in front of the stage. The top floor was also full from what I heard. There were three concerts, first David Barrett who played a great selection of tunes highlighting the old masters of blues harmonica. Second was Marko Jovanovic who has a different approach and mixes a lot of styles into an interestin blend. Last up was Steve Baker who was on fire and played material from his latest CD release. Steve Baker with the band. Unfortunately there were no onstage session after the concerts due to the packed program. This was really missed by a lot of the workshop participants. Saturday was the last day of teaching. Joe continued with the drills based on the study songs. A new study song in the style of Walter’s Boogie was introduced and we worked on key riffs and breathing. After lunch I had a nice rest in the hotel before going to the last workshop of Harmonica Masters Workshops 2018. It was a workshops with all intructors and all students. It was a Q&A session with all instructors mixed with jamming. A good way to end the teaching. 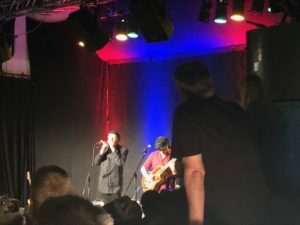 Saturday night followed the same pattern with Harmonica Masters Workshops 2018 instructor concerts. Once again Kesselhaus was filled to capacity. The evnng started with Greg Zlap who played with lots of enegry and captivated the audience. Second was Filisko & Noden who played material from their latest album “Destination unknown”. This was the highlight for me. The concerts ended with Mitch Kashmar who brought his students onstage for one song. Filisko & Noden on stage. Once again we missed the open stage sessions after the concerts. satyed on an talked to a lot of friends as it was the last evening and some people would leave early. Harmonica Masters Workshops 2018 ended with a chill out brunch before most people headed back home. It is always sad to say good bye to everyone but we were all looking forward to 2019. Joe and I at the chill out brunch. The trip home went smoothly although with a lot of waiting. 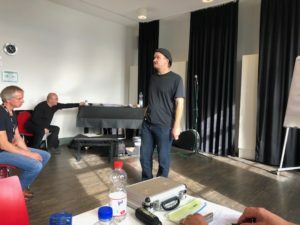 This entry was posted in Blues Harp and tagged harmonica masters workshops, HMW 2018, Trossingen, workshop by Fredrik Hertzberg. Bookmark the permalink. Glad you liked it! Working on the material from class now.